Mish's Global Economic Trend Analysis: Global Oil Consumption Report: What Countries Have Increased or Decreased Oil Usage Since 2009? 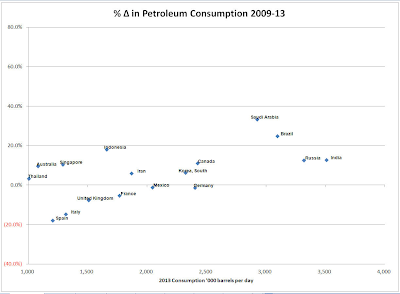 Global Oil Consumption Report: What Countries Have Increased or Decreased Oil Usage Since 2009? Reader David Epperson sent in some interesting charts on global oil usage that he produced from U.S. Energy Information Administration (EIA) data. The data is through the end of 2013. I was curious how much oil consumption had declined over the last few years, so I went to the EIA web site, downloaded the consumption data and produced the following charts. The data represents the percentage change in oil consumption from 2009 to 2013, the latest year non-OECD data were available. This is an absolute percentage change, and not an annualized change. For instance, oil consumption in Spain was roughly 20% lower in 2013 than in 2009. This was about the same rate of decline seen in war-wracked Syria. Greece was down even more, close to 30%. In order to make the data labels readable, I’ve had to separate the charts into three. One shows countries in the 1 million to 20 million b/d group. The next shows the 1 million – 4 million club (all large countries excluding the US, China and Japan), and the next shows the 100,000 to 1 million b/d club. I’ve excluded the 141 countries in the EIA database whose consumption was less than 100,000 b/d, since these only account for about 3.5% of total global demand. The sum for the entire world was a 6.5% increase from 2009-13. 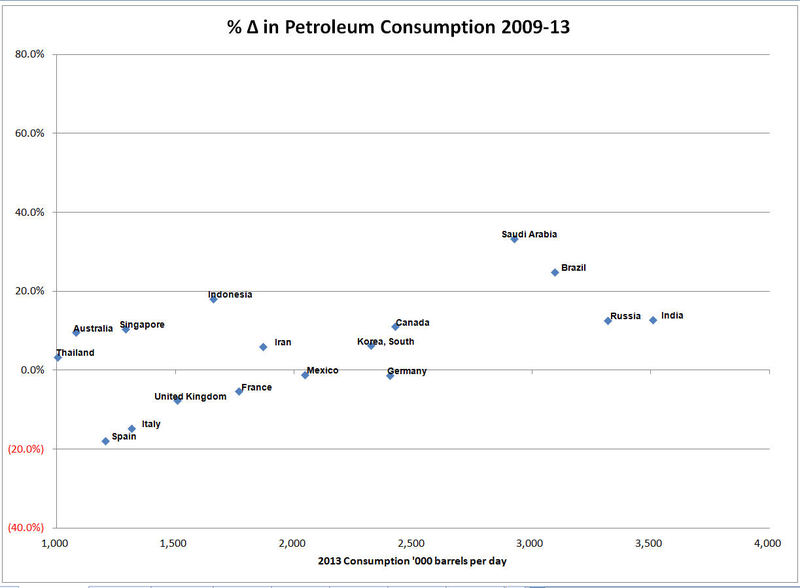 Global oil consumption is up 6.5% from 2009-13. China alone accounts for 28.5% of that growth. The top 5 global oil-growth contributors (China, Saudi Arabia, Brazil, India, and Russia) account for 66.7% of global oil usage growth since 2009. BRIC (Brazil, Russia, India, and China) GDPs, especially China and India are highly unlikely to grow at projected rates, especially if global oil production does not keep up. Japan is also on a dangerous path. Abenomics would look far worse were it not for declining energy prices.